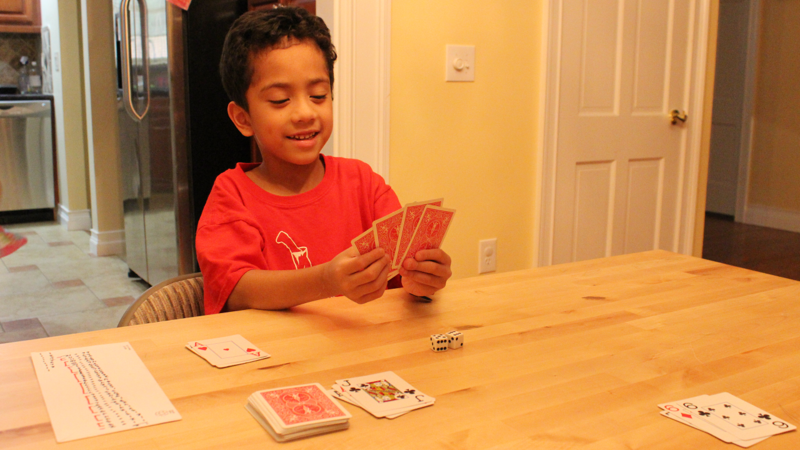 My six year old got a deck of cards recently, and has enjoyed playing some of the classics with me (War, Go Fish). He also got his hands on a pair of dice, which he enjoys rolling (half for the sound, I’m sure). Yesterday, he asked me to teach him a new card game. Since he has been working on addition at school, I figured I’d combine the two into a game that would help him memorize some of the addition table. We haven’t come up with a name for it, yet, but after a few iterations, here is the game we came up with. Equipment consists of one pair of dice and a deck of cards. Note that the deck does not have to be complete, which is pretty important with kids this age… Aces count for 11, Jacks, Queens and Kings count for 7 (to better fit the dice roll distribution). Each player starts with 7 cards, with the rest placed in a draw pile. Each turn, the player rolls the dice and adds them. If the player has a card with that value in his hand, he discards it. If he has cards that poker-match (not value-match) the one he is discarding, he discards them, too. If he has no match, he may choose to discard one of his cards (particularly 2’s, 3’s and Aces) and then draw another. If the one drawn matches the dice roll, he may discard it. If he rolled a 12, he draws a card, instead. Any roll of doubles allows another roll. The winner is the one who discards his last card. The game plays pretty fast, and there are enough surprises to be pretty exciting for the kids. The next rule iteration will be to make Jacks, Queens and Kings worth 6, 7, and 8, respectively. I briefly toyed with the idea of allowing two-card discards, one for each die rolled. However, that would over-value the low cards, make the Ace overly-complex (it would have to count as a 1 or an 11), and would devalue the statistics lesson. I had written out all the possible dice rolls and their totals, to help explain why one would want to prefer saving 6’s, 7’s and 8’s over 2’s, 3’s, and 11’s (except in the case of matching cards, of course).